Cesak Chiropractic Family Wellness Center (Houston) - Book Appointment Online! We welcome you to Cesak Chiropractic Family Wellness Center! 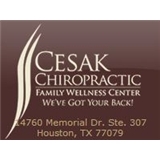 Since 1997, Cesak Chiropractic Family Wellness Center has been working to provide the best chiropractic care for patients in the West Houston area. Dr.Cesak's experience in chiropractic is coupled with genuine concern for his patients. Our goal is to help you achieve and maintain your optimal health. We can help you relieve back pain, we offer physical therapy and massage, and neck pain is a common problem that we can often resolve in as little as a single visit! Very friendly staff and for being my first time at chiropractor he made me feel really comfortable with everything and was very professional.